Arrrrrrrrrgh! Two sea dogs we arrrrrrre! It's another soggy day up here in the Pacific Northwest, but we managed to find the only spot of sun yesterday, and we used every scrap of it. Good Old Boat magazine's Karen Larson and Jerry Powlas drove up from where they were staying on the Kitsap Peninsula (at GOB writer Richard Smith's house) and we set off: Karen, Jerry and Jim in Sockdolager, and me aboard Minstrel. It was a glorious sail and lots of good photos were taken. Sockdolager had to put the pedal to the metal as the chase boat under power in order to keep up with Minstrel under sail. From shore it probably looked like a Keystone Kops chase scene. 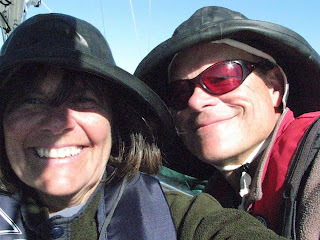 Karen and Jerry, who had cooked us a STEAK DINNER the night before we sailed, are flat-out fun to be around, and I look forward to enjoying their friendship and writing for their magazine for many years to come. This photo is not from yesterday, but it shows you what Minstrel under sail looks like. By now you may have guessed that we'll be taking Jim's boat to the Queen Charlottes this summer. Minstrel will stay behind, and I am renting out my house for the summer to a colleague/friend from the Fish and Wildlife Service, who is moving to Port Townsend from Portland, OR. I'll be reachable by email or via Jim's cellphone. We'll email that number separately. We're assembling cruise materials (thanks to friend/sailor/musician Bertram Levy for the loan of many Canadian charts) and are route-planning now. The route will include some offshore passages, the first of many, we hope. Life is good, in spite of the economy. It is, frankly, as good a time as any to take off and go sailing. You can live pretty cheaply on a boat if you're careful. And in the wilderness of islands and remote peninsulas we plan to visit, the absence of traffic and TV and shopping malls will be a sound that rings as clear as echoes off a mountain fjord. Okay, so we don't own a TV, Port Townsend has no shopping malls, and the traffic is minimal here. But we still won't miss those things. From last summer's cruise, Sockdolager and Tonic at anchor in Wallace Bay, BC, and S. anchored alone in Wolf Bay, where a pack of wolves howled most of the night. It's the time of year when the wind around here subsides from 40 knots to 35. We've been busy, very busy. With the help of a contraption called a Boom Truck, we unstepped the mast on Jim's boat a month ago and completely replaced all standing and running rigging. We also converted Sockdolager from a sloop to a cutter, adding a new forestay and running backstays for the staysail, and we installed a track on the mast for a storm trysail. Then, just for fun (and at the urging of rigger Brion Toss, who promised it would be easy), we pulled the bowsprit and its platform off to inspect and refinish. (Note to selves: when Mr Toss says something will be that easy, be very, very afraid.) Jim has been spending the hours in which he normally sleeps making all kinds of improvements, such as bronze chafe plates for the anchor, and having bronze fittings custom-cast at the PT Foundry, which is, amazingly, cheaper than assembling parts off-the-shelf. Not to mention twice as gorgeous. The glare from the bow platform's Xtreme Varnish Job atop the newly reinstalled bowsprit is causing dock denizens to think the sun is out. Nothing like nine coats of velvety-smooth Captain's varnish to point out what else needs it. And the rig! We did all the work ourselves, but with the expert advice of Brion and Gordon, we have achieved a near-nirvanic state of Xtreme rigness. And did I mention my boat? Minstrel, we learned a few weeks ago, is going to be the subject of a feature article in Good Old Boat magazine, sometime in the next two or three weeks. Editors Karen Larson and Jerry Powlas are enroute by car from Minnesota as I write this, to visit three of their Northwest writers. I have been spending the hours in which I normally sleep getting her ready for a photo shoot. A somewhat comic boat feature I wrote in this month's Good Old Boat magazine elicited lots of laughs, so maybe this is a form of comically-cosmic payback. Oh, and did I mention painting the house? I got three coats on the front & its trim in February, then painted the rest of the living room and the entire bedroom, plus varnished a bunch of crown moulding and installed it in the bedroom. Yes, Virginia, there is a glutton for punishment, and it's me. Jim, well, he's just a Super-Heumann. But these photos from last year's cruise, in which we were anchored with our friends Carl and Patti from Tonic, yet another Dana 24 (da place is lousy wid dem) in Wallace Cove State Park in Canada and then alone in Wolf Bay, are why we are doing all this work now. Happy Spring! 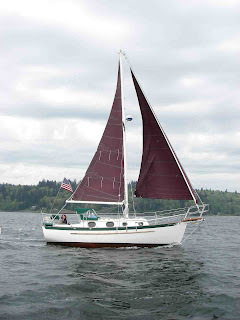 ...in 2007, at a summertime gathering of sailors in Mystery Bay on Puget Sound, two solo sailors who happened to have two identical Pacific Seacraft Dana 24s, met. And shook hands. And talked a little. That was it. After a month, he called her and asked her a few questions about the rake of her mast. We kid you not. The rake of her mast. They talked about rigging for 45 minutes, long distance. Just rigging. A month later he called again, more talk about rigging and mast rake. She thought he might be fixated on rigging. He was fixated alright, but not on rigging. She trekked through China and Tibet for awhile, and when she returned he called her from the Point Hudson marina (he had sailed into Port Townsend for a seminar on... rigging.) He wanted to talk about... Alaska. Not just rigging. Whew. Lunch lasted two and a half hours. And turned into dinner, an exchange of boat tours, more phone calls, some emails, and finally, in December, a first date. Fast forward to late winter 2009--they are completely nuts about each other, have both retired, and are working on... the rigging. Well hey, you need good rigging if you're going to cross oceans on a small sailboat together. Ah, but we digress. This summer's cruise will be north, to Canada's Queen Charlotte Islands and wherever else the weather permits-maybe Alaska. And we know what you're thinking: will they take both boats? One boat? If not both boats, whose boat? His boat? Her boat? Can you say toy boat five times fast? The suspense is unbearable. That's why we created this blog. We will keep in touch from far-flung and near-flung places with this blog. (We just love to say that word: bloooog. It sounds like the sound made by a green Swamp Thing.) We will add links to photos once we get them posted, too. We are Jim Heumann and Karen Sullivan, and we are testing the limits of the theory that there is no such thing as too much fun.